Hi loves! Friday, yay :). Any plans this weekend? I am going to the hairdresser tomorrow and I am gonna ask their advice in what to do with my hair - I am so uninspired! Today I am showing you a combo I really really liked. 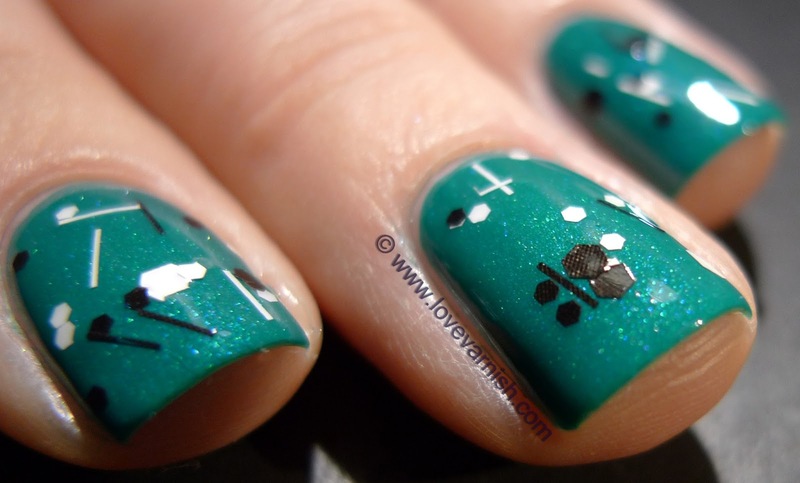 The basecolor is Wet 'n Wild Miama Spirit, a lovely tealish green with shimmer. Boy, does this have a weird brush. It is big, fat, rounded and floppy and it was so hard to work with! But, the color makes up for it. It dries almost matte (which I don't think it should) so topcoat is definitely needed. If the brush wasn't so bad 1 coat probably would have been enough but now I used 2. After it dried I topped it with Makeup Withdrawal Everybody's Doing It (that name - so cool!). This is a glitter topper made of matte black and white glitter in different shapes and sizes. 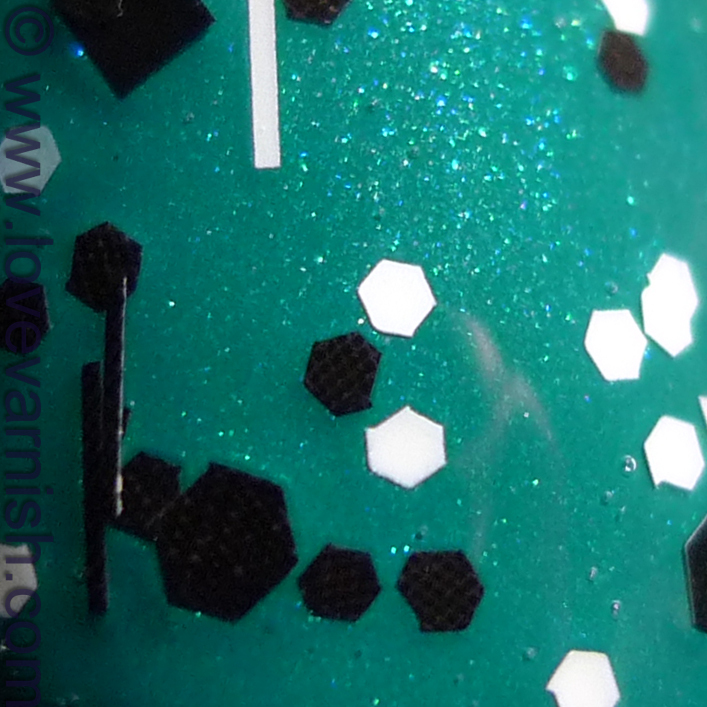 Small hex glitter, larger hex glitter, square and bar glitter. I really love this one so much! It applied quite easy. I first dabbed some of the glitter in the center of the nail, cleared the brush on the bottle neck and spread out the polish on the nail. Do you like this combo? What would you layer a topper like this over? Black and white glitter over a colorful base?! Sold! I love to put toppers like this over all kinds of bright colors, I think it goes with almost everything. Pretty! I love the name too. Pretty funny! It looks cool right? I really liked the combo :). Haha yes the name is so cool!